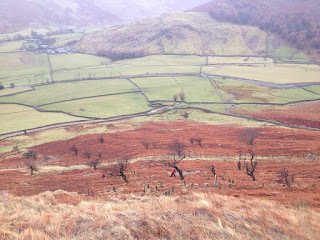 Tree planting at High Borrowdale with Friends of the Lake District. 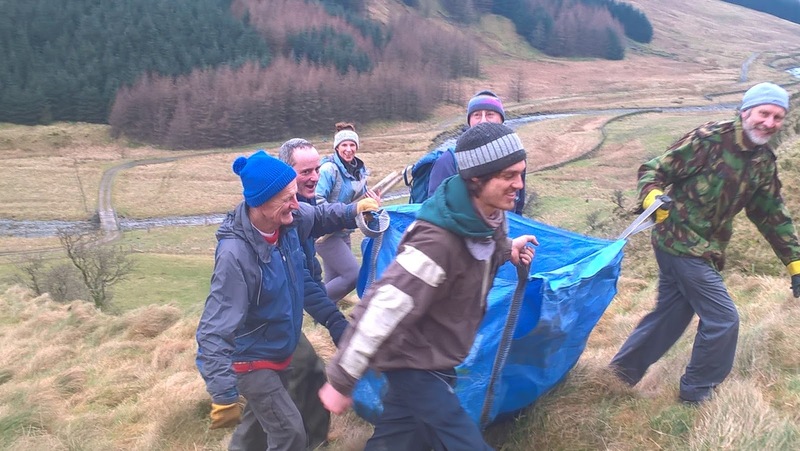 The National Trust actively encourages members of staff to work for up to 5 days per year with other conservation organisations. 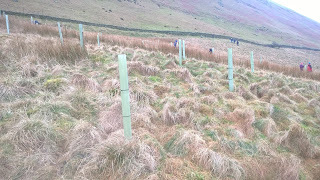 I used one of my days to help with Friends of the Lake District's Fell Care Force Tree Planting Day on February 8th.. See link below for more information. 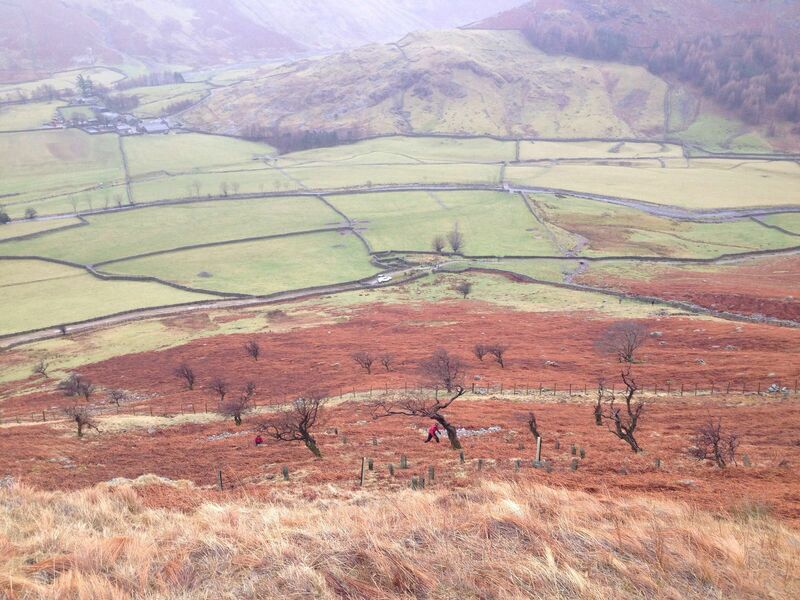 The ongoing project will ultimately involve planting 5200 native trees at High Borrowdale. 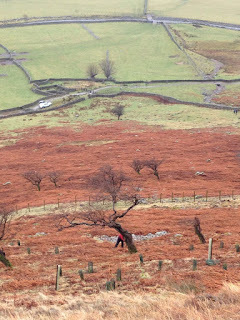 This land, acquired by Friends of The Lake District in 2002, is located north of Kendal and south of Shap. It is also within the newly extended area of the Lake District National Park. 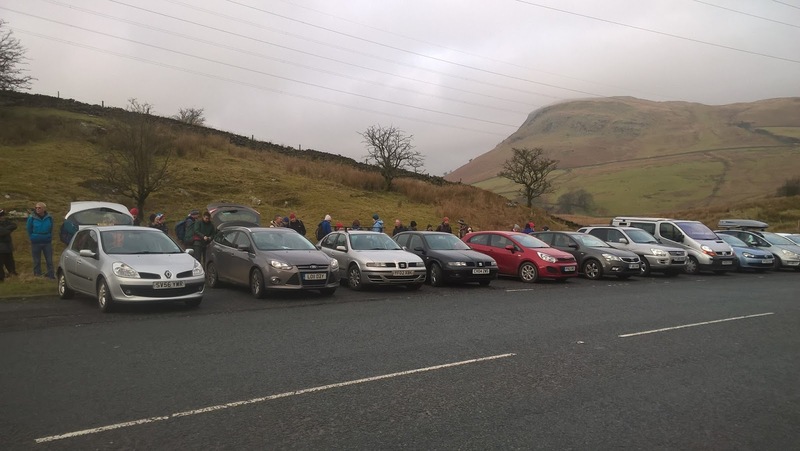 A good turn out of over 50 volunteers were at the Hucks Brow layby on the A6 (GR553030) close to the track that leads to High Borrowdale. 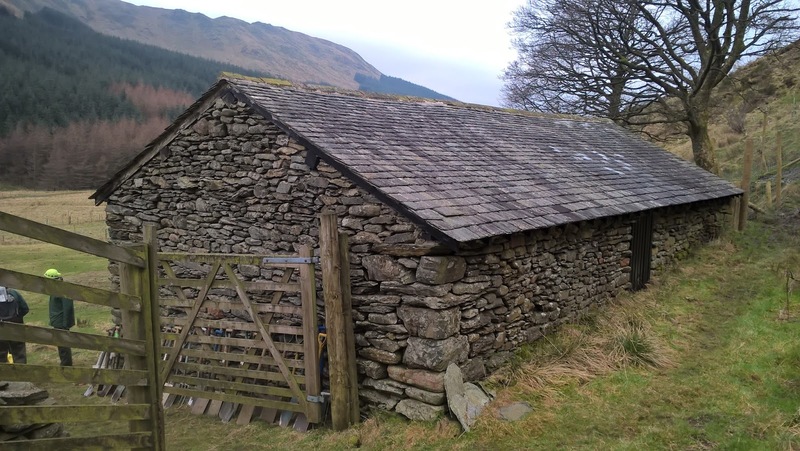 High Borrowdale is within the locality described by Alfred Wainwright as the most beautiful valley outside the Lake District. 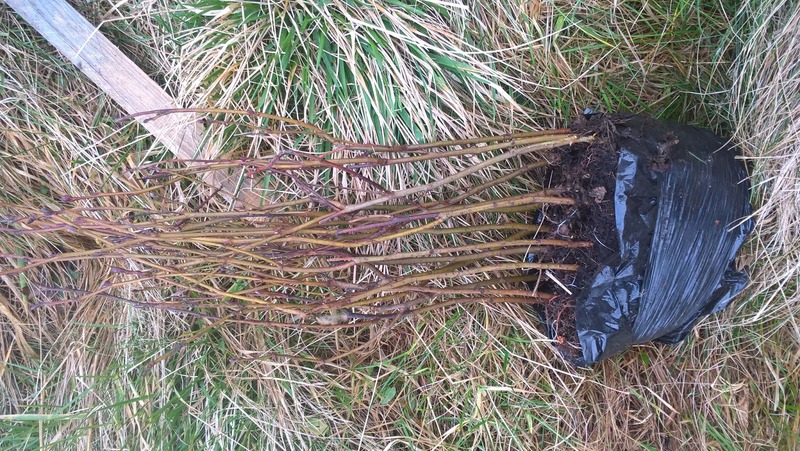 By planting oak, alder, willow, hawthorn, rowan and holly amongst other tree species, a native woodland will be created. This will not only enhance the landscape and habitats but tree roots, once established, will help to combat further erosion. This should reduce the risk of landslides that caused so much damage here in December 2015. 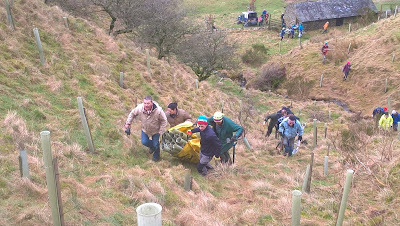 Struggling up the slope with a bulk bag full of tree tubes and stakes. One of the sympathetically restored barns, undertaken by Friends of the Lake District, at High Borrowdale in which the trees to be planted are stored. Like the wildflowers we planted in Grasmere...See a previous post...The alder trees are plug plants, making them easier to plant. 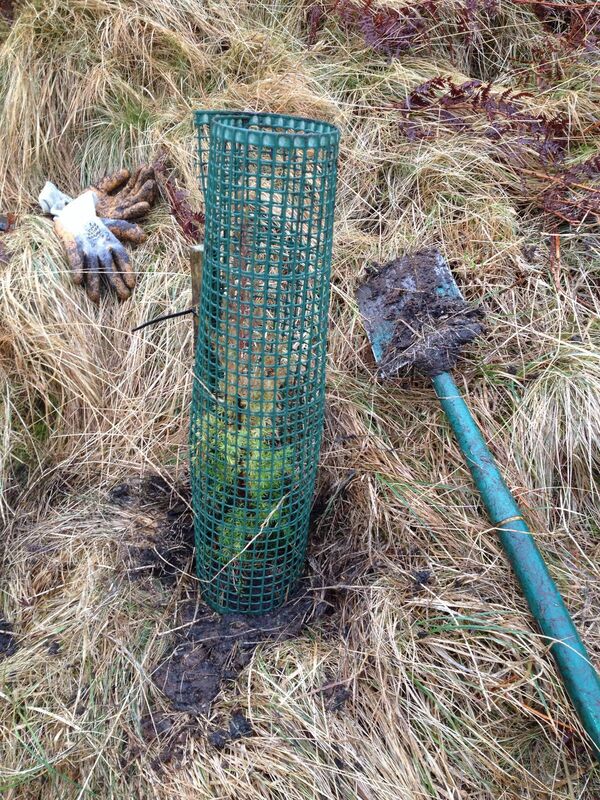 In total more than 600 trees were planted, staked and tubed on the day. 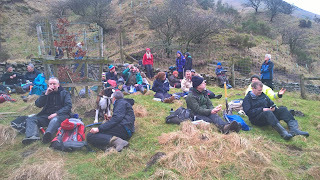 A well earned break and you can get 4G here!. 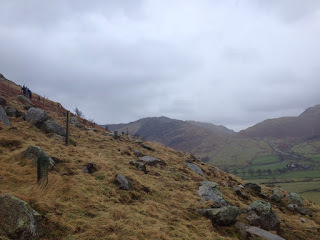 I enjoyed my day in High Borrowdale, felt a real sense of achievement, and look forward to working with Friends of the Lake District again. Recently we have been out enjoying Lakeland’s finest weather - rain! We hope you have too! Some of the volunteers braving the weather to help us! Our team along with help from volunteers successfully managed to plant 50 juniper (Juniperus communis) trees at Middlefell in Great Langdale. 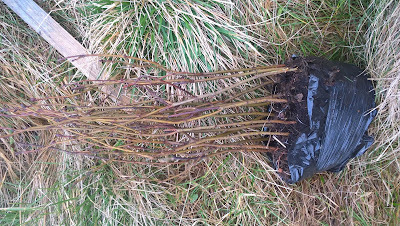 We also planted around 30 other assorted species of tree including Crab Apple, Hazel and Rowan (Malus sylvestris, Cratageous monogyna, Corylus avellana and Sorbus aucuparia). Juniper's poor regeneration is of such concern, that it has been included in the Biodiversity Action Plan as a priority species for Cumbria. View from Middle Fell our site for the day. Various schemes, aimed at conserving juniper, will hopefully safeguard the long term future of this threatened species (see our previous blogs on Juniper planting & conservation). The planting of the additional 30 native trees in keeping with the area will help maintain the biodiversity and wildlife value otherwise in decline. What is Juniper? – One of the three conifers native to England, can you name the other two (answer below). Juniper was one of the first tree species to "colonise" Cumbria after the last ice age. Juniper has been a prominent feature on this landscape ever since. 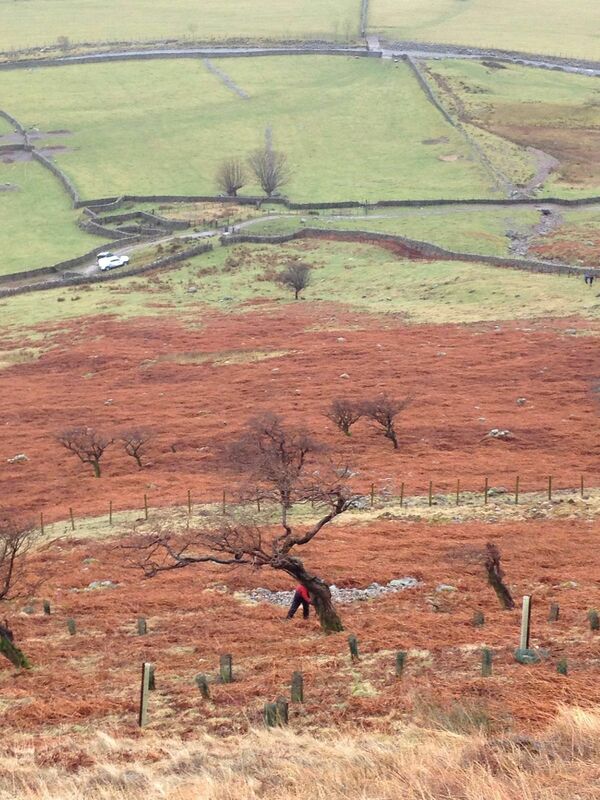 Juniper is best suited to the extreme weather conditions, and poor soil found on the Lake District fells. Having said this Juniper is still in decline in both Cumbria and the U.K.
One of the reasons for Junipers decline is that many of the trees found in Cumbria are now very old; (upwards of 200 years old). Unfortunately, the few seedlings that they do manage to reproduce are also heavily grazed by sheep, rabbits and deer. 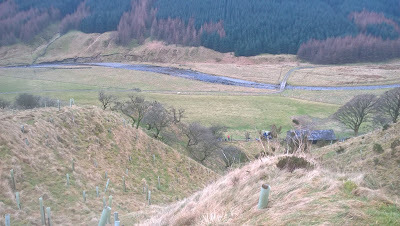 Pete and Liam spotted planting down slope, the trucks can be spotted in the back ground, we were working high up the fell side. Juniper is an important habitat; as it supports, or is host to over 40 types of insects, including the Juniper Carpet Moth. The caterpillars feed exclusively on juniper. Larvae of the Juniper Berry Miner Moth feed on juniper seeds. Juniper's dense prickly foilage provides good cover and protection for nesting birds. Answer – Scots Pine & Yew join Juniper as the three native British conifers. 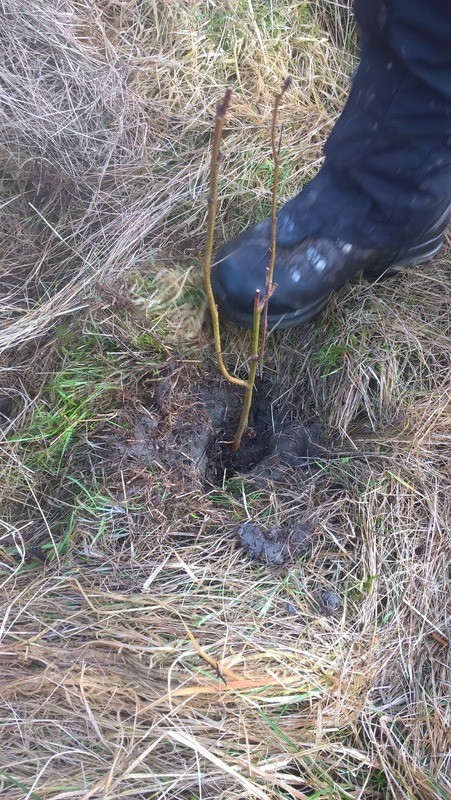 National Trust Rangers, volunteers, local residents and school children gathered together to plant a variety of different trees across the Lake District on 10 February 2017. This was the first ever mass tree planting that the National Trust have organised in the Lakes on the same date and approximately 1400 trees were planted - some of which will be the wonderful veterans of the future. Over 90 people took part at five sites spreading the length and width of the Lake District, including; Glencoyne Park in Ullswater, Hoathwaite in Coniston, Wasdale, Fell Foot on the shore of Lake Windermere, and Coledale, near the village of Braithwaite. these apples where sent off to the National Trust conservation center in Devon. over the three years since picking the seeds they have grown into saplings and on Friday the 10'th of February they were planted back in the park where they were picked. there were 30 crab apple trees to be planted. 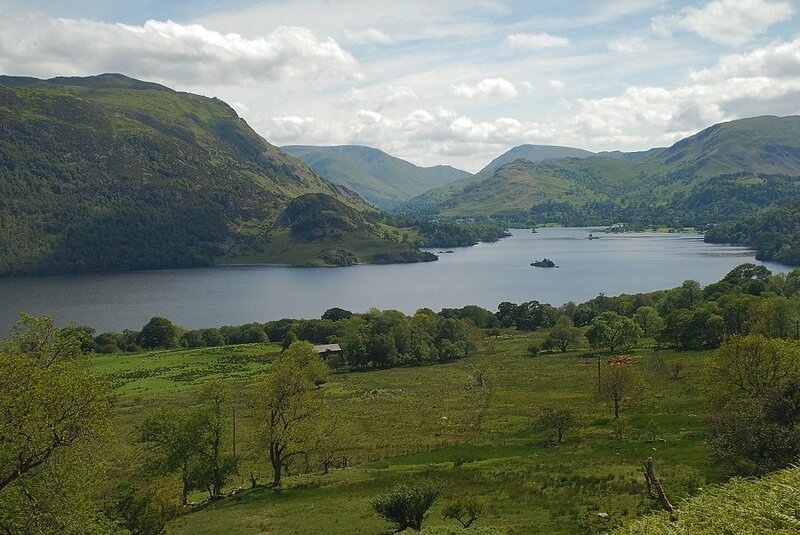 due to Glencoyne being an old deer park there is still a wild herd of deer that can be found in the park, as well as the 12 cattle that graze the land. This meant that each tree had to be planted inside a deer and cow prove tree cage. 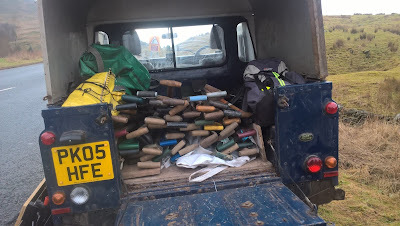 There were a lot of posts and rails to be carried out each cage required 14 rails and 4 posts. A mixture of volunteers, staff and a quad bike helped get everything to sight. Once the 30 sights had been selected the cages could be built. And finally once the cages had been built the trees could be planted. Luckily we had lots of little hands to help us. Patterdale Primary school came to lend a hand. We all had a thoroughly enjoyable day. Lets hope that in 100-200 years time these will be the veteran trees of the future.